PuriTech, a Belgium-based technology company specialising in continuous countercurrent ion exchange, is a leading supplier of ion exchange systems with applications in the hydrometallurgy, mining, chemical and industrial markets. PuriTech specialises in process design, starting from initial pilot trials up to the complete engineering of an ion exchange system for metal recovery. 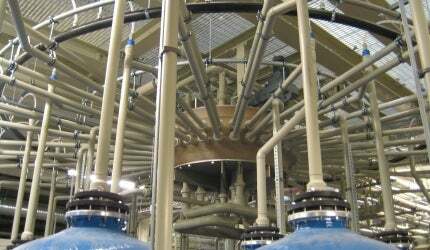 With more than ten years of experience, PuriTech has ion exchange plants in operation all over the world and in a wide variety of applications, including the water, sugar and mining industries. The engineering of a continuous countercurrent ion exchanger includes the initial PFD (flow diagram), P&IDs (process and instrument diagrams), technical datasheets and the complete 3D design of all mechanical and electrical components. This turnkey client-specific service includes initial column testing to select the most economical solution for the client, online pilot trials with our mobile test skids, the complete detailed engineering up to installation and commissioning with start-up of the ion exchange system. PuriTech has supplied pilot installations and processing equipment for a wide variety of metal recovery. Our continuous countercurrent ion exchange or chromatographic separation systems generate process efficiency that is unrivalled or even impossible with conventional fixed-bed systems. PuriTech’s ION-IX system offers a low-cost design with a maximum recovery of the minerals, and flexible operation. A new 200m³/h nickel – cobalt separation unit in Zambia has been designed completely by PuriTech. The detailed engineering, our patented ION-IX multiport process valve and the construction, commissioning and start-up has been realised under PuriTech supervision. The vessels, piping and electrical works have been executed by local contractors. The DOW resin to selectively separate nickel from cobalt has been used in this process. In collaboration with a mining company in the Philippines, a new process has been developed for the recovery of nickel from PLS (pregnant leach solution). After tank leaching and clarification, PuriTech’s ion exchanger selectively removes the nickel from the other metals present in the PLS solution. A second enrichment step for the recovery of other metals such as cobalt has been implemented. Where resin inventory is critical or high recovery of valuable metals is required, PuriTech’s ION-IX system is the ideal choice. Small test skids – pilot installations – are available for online testing and defining of all process parameters needed for the detailed engineering of a production unit. The ion exchange resin can easily be removed or replaced from the ion exchange columns, which enables the testing of different types of resin. To find out more about PuriTech’s products and services, please contact us using the details or form below. To read more about PuriTech's ION Exchange technology, please download the free PDF brochure.